The guys I just make up. Also that’s a Diet Coke. Give me some credit. And I saved most of the bacon for the dogs and I didn’t finish the fries or touch the cole slaw and scraped about half the icing off the cake. So practically a low fat meal. Well, geez, of course, you skipped the cole slaw. LOL I have a limited amount of space for food, so I generally eat the meat, nibble on the potatoes, shun the salad (Bleh), and hope there’s a little bit of space for dessert. But I always eat the bacon. The burger looks super good. Is that bacon I see on the fries? So, since it’s research for a book, and you’re a writer, do you get to write off the meals as tax expenses? If Krissie had been there, I definitely could have since we always talk about writing and publishing, that that would make it a business lunch. I did make notes on the book while I ate. It was on the hamburger. I took half of it off to save for the dogs and to help out my arteries. 4 pieces of bacon on your burger too!?! You are blessed by that diner. And I thought I was taking risks, trespassing in the ruins of a house and garden, with all sorts of hidden stones and holes to trip over. You guys crack me up, especially you, Jenny. You didn’t find the diner first, and move to a house nearby, did you? Cause those pictures make that look like a reasonable plan (might want to blur out the name of the restaurant on the placemats). Nope. Krissie and I went to look at the house. I’d told her to talk me out of it because it was derelict and was going to be a real money pit. So when we were done looking at the house, we asked the realtor where the closest restaurant was and she told us that one, and then Krissie and I got in the car, and I said, “Tell me why I shouldn’t buy it,” and she went down all the reasons–there were many–that it would be a disaster. And then she said, “But you should buy it because it’s wonderful.” Then we went to the diner and talked about it some more. I think we both had fried chicken and mashed potatoes and gravy, which was decadent. And then I bought it. I know that in theory I only stalk you at conventions (with chocolate) but I might have to start stalking you at diners with bacon. We can talk about writing, so we can both take the deduction. Or we can talk about bacon and pretend we’re talking about writing. That looks like carrot cake to me. Do they put walnuts in it? Fiber! it’s a nutrition deduction. Excellent research. Can’t decide which meal I like most. It’s a dirty job, but somebody’s gotta do it. But if there are dead grapes in the carrot cake, it won’t be me. Or my friend Lisa. But it may be Tall Boy. There are no raisins in the carrot cake. 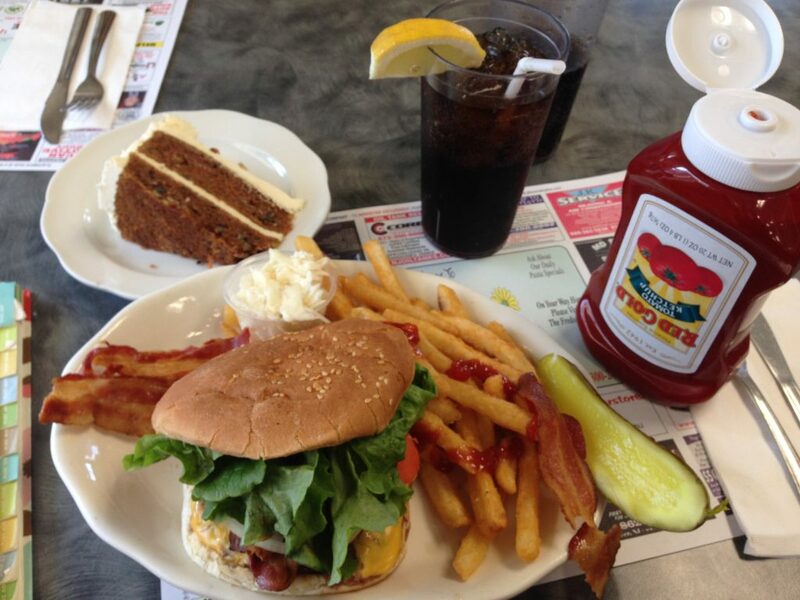 You have a diner near you. I’m so envious. Baca use I am a planner/all around notebook nut, I am fascinated by the glimpse to the left in the first picture with the flurry of – post-its possibly? That’s the edge of a daily planner/calendar book from 2014. One of the things I have to do as I work on a truck draft is block out how many days the story takes, how much time has passed every day, etc. And the easiest way to do that is on a calendar. I have a lot of different options for that one–there’s a great Post-It calendar–but for just noodling around with pages I can rip out and throw away, and old day planner or calendar journal with a week spread across two pages is really helpful. Basically, it’s a paper version of Curio. If I remember, I’ll post a picture of how the notes work, although it’ll be REALLY sloppy. 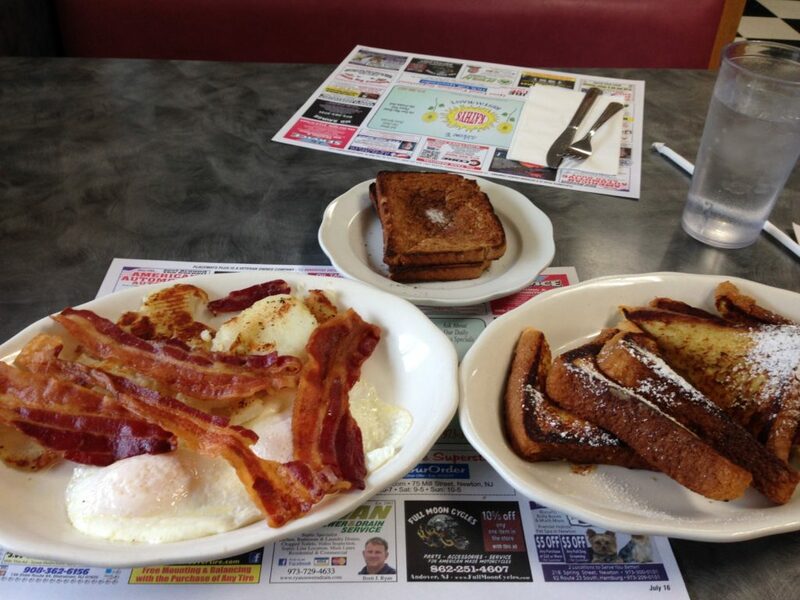 I love american diner food, I love greasyspoons in the UK, but they are dying out.